Nevill Mott was a very important person. He was about my age. He was interested in similar things. As a matter of fact he had been interested mostly in collision phenomena and had written a very good book - I think it had already been written - about atomic collisions with Massey, and he and I got along famously. We went for walks together and occasionally for bicycle rides and we became very good friends. He was a theorist. I also became a good friend of Blackett but he was of... many years older than I, while Mott was my age and had very much... very congenial. [Q] And your interest in Scattering of Relativistic Particles stems from this interaction with Mott, or intensifies? Yes, I think that stems from this interaction, and on the other hand Mott then went into solid state theory, so we exchanged places more or less. [Q] So socially Cambridge was a very important transition. Socially it was very important. I was invited often to college dinners which were always very good. I stayed at a boarding house where the food was very bad, and so it was a happy time. [Q] You already knew English? I knew English... high school English. When I came to Cambridge people would understand me but I wouldn't understand anybody, and this continued for about a month. Then I went to a restaurant on one occasion where at the next table there were some Germans talking to each other and I couldn't understand them either, so I decided now I could understand English. 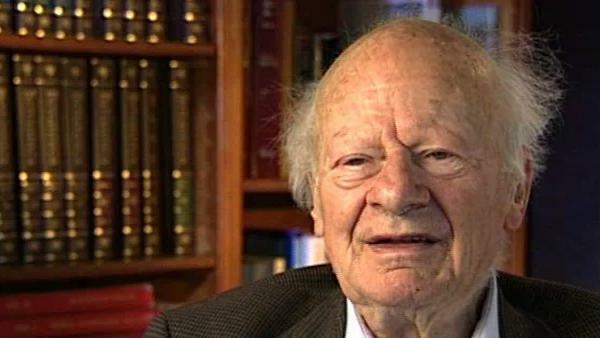 The late German-American physicist Hans Bethe once described himself as the H-bomb's midwife. He left Nazi Germany in 1933, after which he helped develop the first atomic bomb, won the Nobel Prize in Physics in 1967 for his contribution to the theory of nuclear reactions, advocated tighter controls over nuclear weapons and campaigned vigorously for the peaceful use of nuclear energy.